i went along to this event today. you are taken around the site by one of the archeologists who gives a very detailed and fascinating talk about the history of the site through the years . also at the end of the tour you have the chance to see and handle some of the finds . 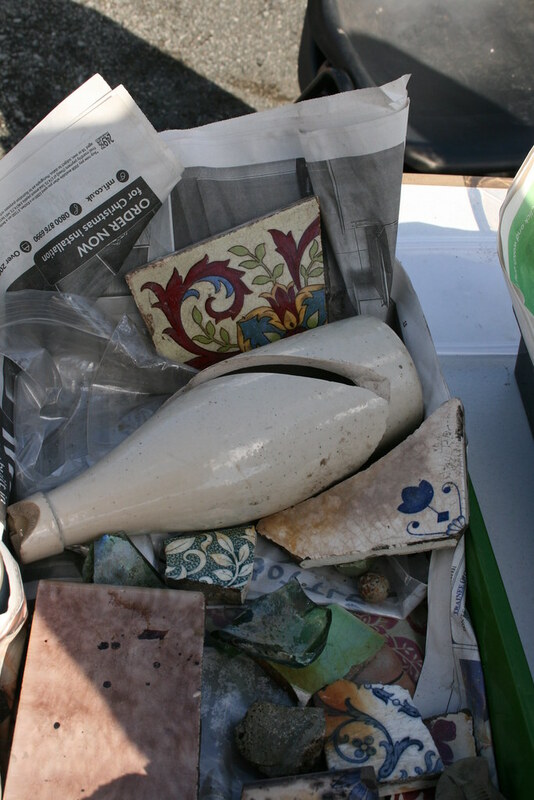 ranging from lots of pottery through to old bottles,lead toys,coins and assorted bits and pieces . and do not worry if you have missed todays tour, in about four or five weeks they will have excavated the other side of the site where the greek thompson tenement stood , over on that side they have already uncovered some really interesting stuff ,like the big marble pillar . get yourselves along to the next event in about four or five week,s as the archeologist said that in a few months it will all be gone forever , to make way for the M74 extension . Great stuff Mr Moto. Did you get more photos? One of the uncovered lane that runs north south at Devon St? I'll need to get along to the next one. Schiehallion wrote: Great stuff Mr Moto. Did you get more photos? One of the uncovered lane that runs north south at Devon St? i am currently loading lot,s more pics on my website,that will take a while , just click on my name on the left , mr moto , and you will find the link to my site, and click on page 9 on my glasgow pic,s section . not sure if i got any pics of the lane you mentioned, but the site will not be filled in for a while yet i think , so you might still be able to go along and see for yourself ? it,s well worth a visit . I went down there this morning and joined the first of the guided tours at 10 o'clock. Nearly all the people in my group were locals who had lived in the tenements on and around the site. It was fascinating to hear them feed all sorts of bits of information to the senior archaeologist which he was unaware of, such as the location of a masonic lodge, which his data indicated had been in a different place. This interaction between experts with their specialised knowledge and ordinary people from the locality with their memories is what it's all about. Well worth a visit indeed. Really good photos. Foss you make Eglinton Street look like Ephesus. When do the old Foundations date from? Are they very early in the 19th Century? I have been fortunate enough to find similar foundations in Glasgow on a number of occasions when clearing Sites for new developments. One of the most interesting ones was near the Mitchell Library on Dorset Street where we uncovered tar lined timber sluice drains. I think we gave them to West of Scotland Water as it then was. 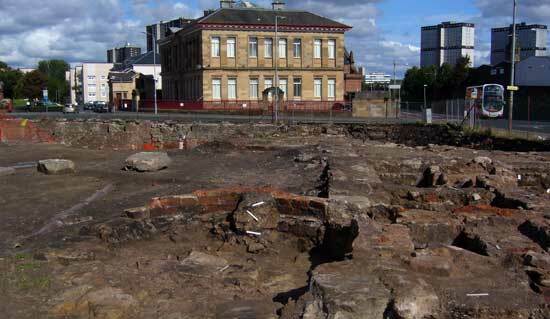 We also excavated loom spindles in Paisley on the Site of the old Grants Whisky Plant. Previously it had been Mills before Grants had taken over the Site. Both finds were before my HG days and the spread of digi cameras I'll have a look to see if i have anything worth scanning. Is the Eglinton Street site where Alexander Thomson's Queen's Park Terrace stood? Sorry, just read the first post properly. Socceroo wrote: Really good photos. Foss you make Eglinton Street look like Ephesus. I'd love to see anything you have re Dorset Street. There will be 3 open days along the whole area of the m74 route. Dixon Blazes and old pottery near the Clyde Iron works. 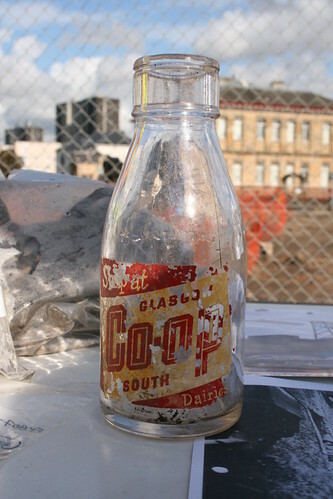 This is real Hidden Glasgow this stuff and to hear peoples stories was fantastic. Did they say what's happening to the stuff found - I'd assume it would go to The People's Palace? They are setting up there own project and a new web site will follow soon. I'm sure we will get a link and more open days are going ahead.make the effort to go next time! cumbo wrote: There will be 3 open days along the whole area of the m74 route.